Jungle Red Writers: HOW DOES THAT MAKE YOU FEEL? 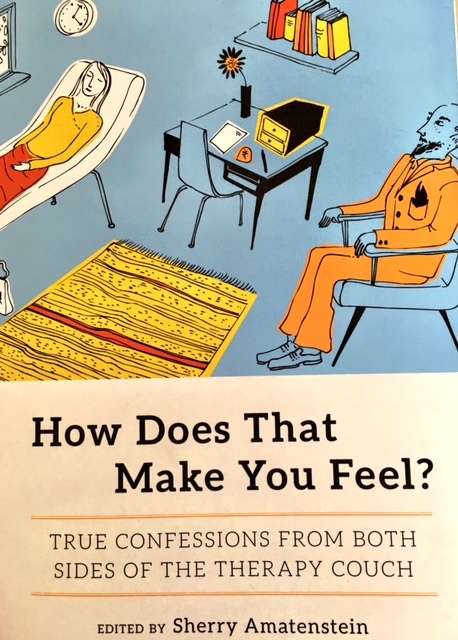 LUCY BURDETTE: I jumped with excitement when I saw an email from Dennis Palumbo several weeks ago about a collection of essays from both shrinks and patients about the experience of psychotherapy, called HOW DOES THAT MAKE YOU FEEL? I ordered it instantly and asked Dennis if he would come to Jungle Red to talk about his essay. Welcome Dennis! The therapy world seems to have changed so much since I worked as a psychologist in private practice. As the editor of this collection mentioned, we didn't have to deal with the minefield of social media and worrying about what our patients might think if (or when) they came across some personal data. When you were approached to write an essay, did you have concerns about telling so much about yourself? 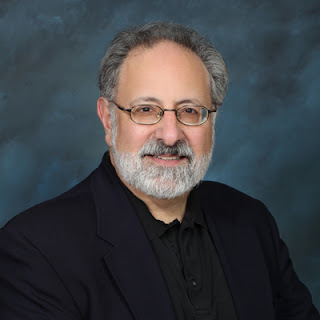 DENNIS PALUMBO: Not really, because I felt (and feel) that it's important for patients in therapy to see that therapists have the same kinds of struggles that they do. Of course, all therapists need to be cautious in terms of personal disclosures, but having a patient know that you can relate to their issues has enormous therapeutic benefit. In the case of this essay, which details my career transition from Hollywood screenwriter to licensed psychotherapist, I believed it was important to let readers know the emotional ups and downs of any major life transition. And that while it may not be an easy journey, it's one worth taking if it's what your heart demands. Lucy: will you tell us a bit about how you use your experience as a therapist and a patient in your novels? Dennis: While I don't use any of my patients' personal experiences as the basis of a novel, I do use what I've learned as a therapist for the past 27 years to inform the writing. How the therapist/patient dynamic often plays out, what might go on in the therapist's head during sessions, the relationship between the current state of the mental health profession and society, etc. More importantly, as in the novels NIGHT TERRORS and PHANTOM LIMB, how certain psychological conditions make a character's personality and actions more vivid and intriguing. Also, since Daniel Rinaldi is a trauma specialist, treating the victims of violent crime, I get to explore issues and symptoms associated with PTSD. I'm fortunate in that I spent five years studying trauma with Dr. Robert Stolorow, one of the nation's premiere trauma experts. I think, on the whole, this experience has been of enormous help in making what my characters go through moving, suspenseful and true-to-life. LUCY: Finally, can you tell us a little more about working with creative people? We have lots of them here at Jungle Red! Dennis: I work primarily with writers, but also see directors, composers, journalists, and musicians. Regardless of field of interest, most creative people struggle with the same issues: blocks, procrastination, fear of failure, anxiety and depression. Not to mention how these issues can impact the creative person's relationships. Though the issues may be consistent across any genre or occupation, how we deal with them in therapy is case-specific. In other words, there's no one-size-fits-all approach to dealing with these issues, primarily because a person's creative struggles are inexorably connected with his or her personal issues. Childhood experiences, career path, relationship history, substance use concerns, etc. I also try to help patients see that it doesn't mean anything negative about them if they're struggling with some creative project. Creative work of any kind is hard, and every artist of real worth struggles. If you think your creative difficulties mean there's something wrong with you, it will only make things worse. As I like to say to patients, "Work the problem. Don't make yourself the problem." And here's a link to a review of the collection in the Washington Post. This is absolutely fascinating . . . . and now I must add your books to my teetering to-be-read pile. Dennis, the book sounds so interesting. Do you think more creative people are crazier? Serious question. My dad, a creative screenwriter, was manic-depressive. Looking back, it may have helped his writing but not so much his home life. And it seemed to me that many of his friends had mood disorders, too. Creative people have to analyze everything all the time- it's part of how we look at the world. ? So that can be a fabulous thing, or that can be destructive . . The only pitfall, though, of a therapist protagonist is that there is a lot of sitting around talking, right? But wow, when it comes to searching for motivation, we're there! Can I rewind a little, Dennis How did you get into screenwriting, and are you glad to be out? I was just about to ask the same question, Hallie! And I wanted to know where are the best resources for writers to learn about the reactions of victims and the families of victims of violent crimes. I find this is an area often glossed over in crime fiction or treated very superficially. I must know more, Dennis. Michele, that is one of my pet peeves about some novels. There's a murder and it feels like, right away, la-la-la life goes on and we're looking for clues. Which reminds me that despite how much I loved the Netflix TV series Stranger Things, I got upset at the way no one mourned Barb. Where was her family? We do get attached to our fictional characters. When I finally went into short-term therapy for depression, my therapist refer to it as "the artist's disease," since so many creative people seem prone to it. It's been fascinating to see that within my lifetime therapy has gone from being something only people in a Woody Allen movie do, to a process that vast numbers of people participate in at some point or another in their lives. I also mention that one of my oldest daughter's friends I'll also mention that one of my oldest daughters friends majored in psychology in college because she felt that would be the best bass for any career she might pursue. It seems as if she may have been right! I, too, wonder if creatives are more prone to things like depression, OCD, manic-depressive. Think through history how many artists, writers, etc. seemed to have symtoms of these conditions. Do you think it's because of the way creatives look at the world or because we put so much pressure on ourselves? Or something else? Or am I simply seeing something that isn't there? That's a common question, and deserves a longer answer than space here allows. But in my experience (backed up by years of clinical research), this idea that creative people struggle with more psychological issues than non-creative types is simply not true. For one thing, most writers use their own feelings and experiences as the raw materials of their craft, and as such are much more self-closing about their own issues. In other words, a writer will write (and often talk) about his or her psychological issues while a lawyer, doctor or presidential candidate won't. Moreover, the number one indicator of, for example, depression is suicide or attempted suicide, and writers are nowhere near the top of the list (dentists and shrinks are!) Remember, Van Gogh did suffer from symptoms that we'd today label as bipolar, but he was also supremely talented. In my own practice, over 27 years, I've found that my writer patients are no more psychologically troubled than the doctors, lawyers, accountants and other people I've treated. But while a writer might use anti-depressants to treat his or her depression, someone who eschews therapy will self-medicate with alcohol. While denying there's a problem at all. I agree, writers and therapists have in common their interest in what motivates people. That's why I like wearing both hats. However, in terms of your concern that a psychologist protagonist just sits around talking, I think you'll find that's not the case with my Daniel Rinaldi books. In FEVER DREAM, for example, he's on-scene at an armed bank robbery, treating one of the released hostages and getting involved in the investigation. In NIGHT TERRORS, he's literally abducted in secret by the FBI to treat one of their own, a retired profiler suffering from the condition. In PHANTOM LIMB, one of his patients is kidnapped, and the kidnapper insists that Daniel deliver the ransom. So I make sure my hero is out in the field and intimately involved in each case. Remember, he's a police consultant, an expert of treating victims of violent crime, so I always try to use that to make it credible that he gets involved. That's why I've always liked what KIRKUS REVIEWS called him: "Jack Reacher with a psychology degree." In answer to your rewind question: I got into screenwriting because I'd always loved movies and TV. After a stint in advertising back east, I realized I was substituting writing ad copy for what I really wanted to do. So I came out here to Los Angeles and, after the usual struggles, got into TV writing. Then, subsequently, writing for the movies. I was extremely fortunate in my Hollywood career, but after discovering how much I loved psychotherapy (as first a patient, then a student in grad school), I was happy to make the career switch. I must admit, I'm glad I did. I've never regretted for one moment retiring from show business. Not only do I enjoy being a therapist, but it gave me the opportunity to return to my first love, writing prose fiction. I heartily agree with you. Most crime fiction I read (and see on TV and film) glosses over the experience of the victims. That's why I made my hero a trauma expert who treats crime victims. In my books, I always try to emphasize the harrowing experience of those victimized by violence, especially the after-effects. What it's like after the crime for the victims, especially those suffering from the classic symptoms of PTSD. I was fortunate in my psychological training to study for five years with Dr. Robert Stolorow, one of the nation's leading experts on trauma. His books, though fairly clinical in style and execution, can be very illuminating for a writer. I'd also suggest looking online for memoirs of crime survivors, or true-crime books whose authors spend a lot of time writing about the experience of the victims. I agree with you about Barb in Stranger Things. I thought her death and its aftermath were poorly treated. (God knows, with eight episodes, there was time to explore it!) I also thought it strange that the disappearance of the only black character, one of the three lead kids, wasn't depicted as a cause of concern for his parents. SNL seems to have agreed with me, since they did a sketch about that fact last week on the show. HI Dennis, really interesting interview. I wonder if creative type are more prone to depression because we spend so much time alone. We are the center of our own little universe and we don't get the normal escape valves of laughing around the water cooler etc. I make sure I have enough social interaction, get out and hike, eat lunch with friends, but it takes an effort, especially when deadlines loom. I'm chagrined to hear that your therapist called depression an artist's disease. As I mentioned above, writers (and other creatives) are simply more likely to explore their inner world, to mine it as the raw materials of their craft, and so are more comfortable talking about (and admitting to) depression or anxiety. But many non-creatives suffer from depression and anxiety, and that's not counting the countless people (primarily men, unfortunately) who don't disclose this, even to themselves. They just drink, use drugs, over-work, etc. as a form of self-medication. As to your daughter's friend: majoring in psychology is never a bad idea, I think, no matter what field a person ultimately pursues...if for no other reason than the study tends to encourage students to examine their own emotional lives, the recurrent patterns in their behavior, their fears and beliefs, etc. I think I tried to answer your question in my previous comments, but I like your observation about how artists look at the world. Writers in general find people, and their interactions, interesting, so I don't see why they wouldn't feel the same way in terms of self-examination. Writers tend to want to understand why people do what they do, and so it seems natural that they'd wonder the same things about themselves. But, as I've said, remember that artists are more likely to self-disclose than people in other professions. A writer can say, "Yeah, sometimes I feel like I don't know what I'm doing." But very few surgeons or trial lawyers would say that (and I've had both as patients, and that is in fact exactly what they've said to me). Dennis, I love that you're writing about this. For a writer, so much of what we do requires an inner journey, a pealing back of the onion skin. To get it right on the page, a writer has to understand the feeling and motivation of character. Your words today inspire me to go deeper. Thank you. And, like you, I've always wanted to deal with the psychological aftermath of violent crime in my books. Hmm, I haven't seen Stranger Things, although it has been on my list. Now, I'm wondering, should I watch? A possible place to find information about victims of crime is government documents. It might take some digging, for example the Office for Victims of Crime is a part of the U.S. Department of Justice. This office might provide statistical data that a savvy author could use to springboard a good narrative. The Library of Congress holds countless spoken narratives from everyday folk. This could be another source. Dan Savage's You Tube "It gets better" project provides first hand accounts of bullying and life changing experiences for the GBLT population. Thanks to the internet, source material is everywhere. As a reader, I prefer works where the protagonist is affected by the events in prior books. It makes the person seem more real to me. Sorry to be late to the conversation--thanks for all the thoughtful comments Dennis! Debs and Coralee, yes I agree the aftermath of the crime is so important--both for the victims and the detectives. Of course a professional will have built up psychological defenses or he/she wouldn't be able to continue to do the job--but a crime and its aftermath has to have some effect. this is so important to remember with cozy mysteries--though serious cozy readers don't want too much angst, I would be unhappy to write about a cozy amateur detective who carries on without feeling changed by violence. Dennis Palumbo - I was thrilled when you agreed to participate in my anthology and it was a pleasure meeting you when we did an event together at Flintridge Bookstore. Jack Reacher with a psychology degree! That is --irresistible! And it can take so many directions- Miss Marple (no degree) did a fair amount of psychology herself, right? I think you may be right about how much time writers spend alone. That aspect of the job probably does encourage a lot of self-reflection. I recall a line from the wonderful writer Annie Dillard, who said that when you spend too much time alone, "the brain eats itself." So I agree that writers need to get out of the office, spend time with friends, have lunch with colleagues, go to conferences, etc. Thanks so much for the kind words. I'm also so impressed with the questions and comments I'm getting today. In fact, they illustrate what I mean by a writer's natural inclination toward self-reflection. I hope you DO check out my Daniel Rinaldi series. I think you'll like the books. Regardless, please let me know what you think. Re Stranger Things: I'm a semi-fan. I thought it could have worked more effectively if if were half as long. Many scenes seemed repetitive to me. However, I should confess I'm kind of allergic to those Spielberg-suburban-kids-on-bicycles running around trying to solve things. I resonated much more strongly with the adults, primarily the sheriff and Wynonna Ryder's character. Glad you like the "Jack Reacher with a psychology degree" quote. I get a kick out of it myself. Yes, Miss Marple certainly used her understanding of human nature to solve crimes. Though, to me, sometimes her intuition as to methods and motives bordered on the supernatural! Thanks for the excellent suggestions as to where writers can find out more about the psychological effects that crime victims experience. I didn't know about the Dan Savage YouTube project, but applaud it. Glad you're joining us, Roberta! I too wouldn't want to hear my surgeon (or dentist, or lawyer, or car mechanic) admit he or she didn't know what they were doing! Nor that they suffered from anxiety, depression, fear of failure, etc. But most people in every profession do struggle with such issues, at least at times. Thanks for inviting me to contribute to the anthology, Sherry. The book's list of contributors, both therapists and patients, is really impressive. This collection is definitely a must-have, whether you're among the shrinks or the shrunk! I foresee a trip to the bookstore in my very near future. After reading descriptions of your novels I know I would learn and be entertained at the same time. Thanks for being here today! I'd like to read the anthology, too. Wow, what a nice thing to say! I hope you DO check out my Daniel Rinaldi novels (you can read a sampling of blurbs and reviews the books have received on my website). Please let me know what you think of the good doctor. Did Bob Dylan try a therapist? He seems to have used religion as a temporary relief. This doesn't seem to come up much except with Jung. Good question about Dylan, Wayne. I don't know if he ever saw a therapist. I wonder if anyone reading this out there knows the answer. Great Q&A. I always learn something from Dennis. Thanks for the kind words. And, of course, I always learn something from YOU.